This metaphor picture came to me when I was vacuuming the house! I found myself pondering the noise & many distracting things we have in modern life. Don’t get me wrong, I like our technology & I like all the things we have available these days, but I also realise that it is easy to become overly dependent on these gadgets, for our entertainment & miss the subtle communication we can have with God, in the hurly-burly of modern life. 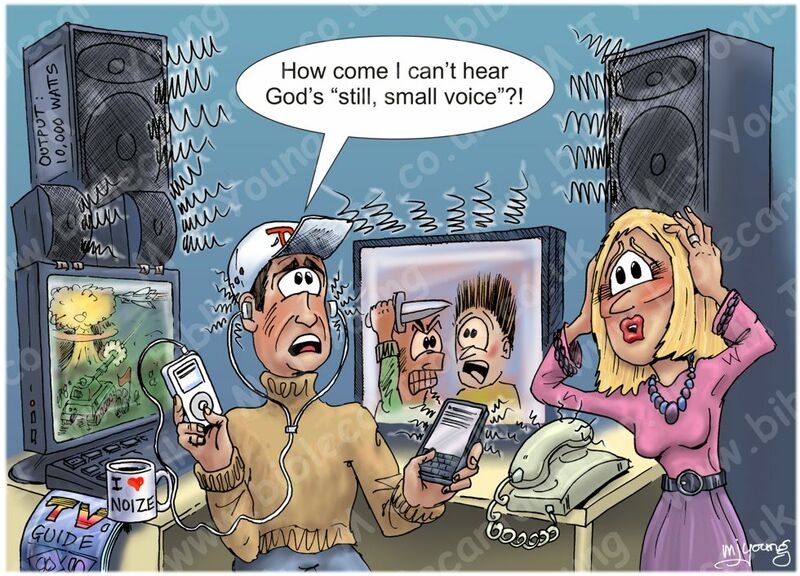 The young man in the picture is bemoaning the fact that he can’t hear God’s “still, small voice” , & yet it is hardly surprising, since he is surrounded by hi-fi equipment, computers, TV, mobile phone, iPod, telephone, magazines, etc. This list of items is not exhaustive; I’m sure there are lots of other things which are distracting to us! 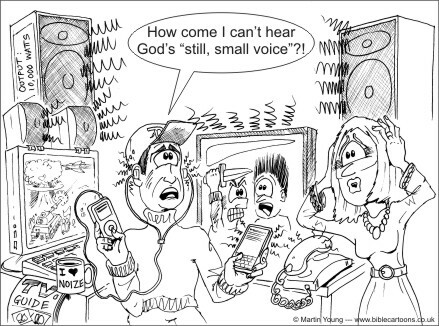 Sermon/teaching theme suggestions: This picture could be used to talk about the distractions we face today, especially from modern technology & gadgets. It could be used to suggest an alternative way of life – not necessarily getting rid of the technology, but deliberately limiting our own exposure to it, so that we can deliberately slow down & make time to be with the Lord.